The Internet is an integral part of business communications, however it was based on open standards without due regard to security issues consequently security threats are not only persistent but also increasing. The Computer Security Institute (CSI) 2007 reported a doubling of average annual loss by US companies. There are three primary network security threats: policy, technology, and configuration. 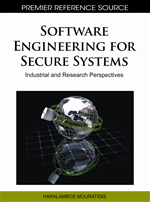 This chapter is primarily concerned with the configuration and management of network devices. There are a number of different network management tools currently available, however typically it is problematic to concurrently display configuration data from devices and protocols whilst maintaining a navigational context. This chapter demonstrates how the State Model Diagram method is not only a universal model-driven network tool but also useful for the configuration and management of complex security protocols and devices. Based on a heuristic evaluation method Nielson developed criteria for a successful human interface (Nielsen & Molich, 1990), (Nielsen). These criteria may be used to evaluate security related interfaces (Furnell, 2007). To address issues specific to interfaces for security purposes Johnston proposed criteria for a security Human Computer Interface (HCI-S) (Johnston, Eloff, & Labuschagne, 2003). HCI-S criteria are defined as: convey features; visibility of system status; learnability; aesthetic and minimalist design; errors; satisfaction and trust. Despite advances in GUI development, administrators continue to use the CLI (Takayama, 2006).